HomeShopping“I have nothing to wear”: How to solve our biggest problem forever with clothes? “I have nothing to wear”: How to solve our biggest problem forever with clothes? 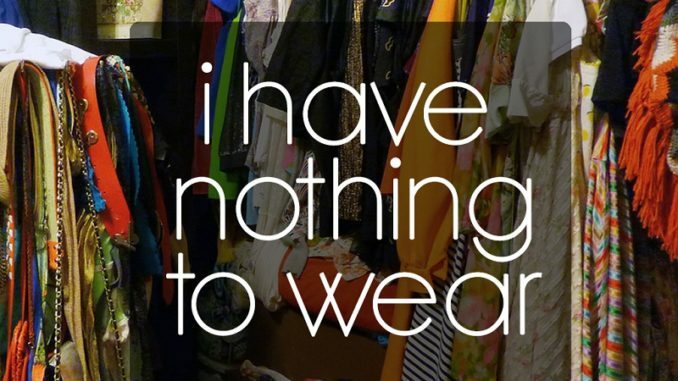 How many times have said this phrase while you watched your closet? “I have nothing to wear” is a common complaint of most women when we are going to wear. And it’s not always because we do not have any clothes in the closet, in most cases we have too many clothes but do not want us to get anything we have. This is what happens when you open the closet and exclaim that phrase. You have accumulated so much clothing you do not see what you have .Each time you open the closet run the risk of being buried by a mountain of sweaters. You are unable to spend and see the clothes hangers because they pile up. Everything seems normal ugly; even if you hide in your closet cute things with this presentation may not like us anything. You may also like to read another article on LifeStyleQA: What you need to consider, when shopping online? Buy a lot of clothes to go out at night or for parties and events, and then in your day to day do not you wear those clothes. Or can you buy a lot of clothes thinking about work and then have nothing casual for the weekend. You have changed size (slimmed down a lot, gained a lot), or have just given birth, and it is normal that almost all the clothes you look bad. You do not even know what goes and what does not. You probably have more clothes than you need , or impulse buying, because you see monkey on the perch, because it is a trend that is fashionable but do not buy thinking about how and when to get that look. These measures will solve your problems forever costume. Make a good cleaning closet. If the garment is damaged, if not years you put it, if it’s not your size, remove the storage or donate it. Build a good wardrobe. Although it is more fun to buy a dress with a patterned fashion a white blouse, the latter will be worth now and a few more seasons. Combine clothes trend with clothes wardrobe and you will succeed in your looks. The classic clothes serve as base to build your outfit and then just add something to wear to go to the last. Think about your lifestyle and your needs when you go shopping. I do not understand people 300 or 400 dollars is spent on a dress for a wedding and then in their daily purchase shirts to 10 dollars. How many times have you put the dress and how the shirt? Adapt your purchases and allocates a budget commensurate with the kind of life you take, for example, 70% of your spending on clothes for work, 15% of your spending on clothes to go out and special occasions and 15% of your spending in casual clothes and casual. When you buy a new garment, think first you do not have something similar already in your closet, and second, try to find at least three pieces or three looks with it snaps . So will you buy clothes very combinable always adapted to your wardrobe. If you have items to which no party bags, take inspiration from the street style and searches as combine for example, a red skirt, and so have hundreds of ideas to return to wear it to buy clothes or that they are great with that skirt. With these solutions, you will buy more rational and better clothes will take advantage you have in the closet. You’ll have more ideas to know what to wear in the morning, the clothes will give more game and so do not eat coconut with eternal little phrase.